I'm going to be completely honest and say I'm about a year and a half late in writing this. For some reason, all of my truly travel related post have been tangled up in the drafts folder!? But enough is enough, they deserve to be published too! So without further delay, who wants to hear about my time on the Carnival Elation cruise ship? I spent the first week of 2016 cruisin through the Gulf of Mexico with my very big blended family and as memory recalls, it was truly glorious! Trying to think back on all the details and order of events for this post has me feeling overwhelmed with gratefulness all over again! What a blessing that trip was! Firstly... Carnival Elation is a 70,367 ton Fantasy-class cruise ship operated by Carnival Cruise Line. 14 Decks, capacity for 2054 guest and 920 onboard crew, several bars, casinos, pools, water slides, shops, restaurants, many entertainment areas, ping pong tables, mini-golf course, running track, a gym, spa, jacuzzis, salons and the list goes on!! Entertainment is endless! The comedy show, waterslides and ping-pong table were my personal favourites. Who could complain when you have 24 hour access to food. From the deli, to the mongolian wok and everything in between, like our regular stop in for the best soft-serve ice cream, a cruise really offers something for all tastebuds! We even had sushi and a couple delicious salads! We spent two days exploring two different parts of Mexico. The most notable one being the day we swam with Dolphins, snorkeled amongst stingrays and enjoyed more bottomless food and drink, which included the most fabulous cocktails! 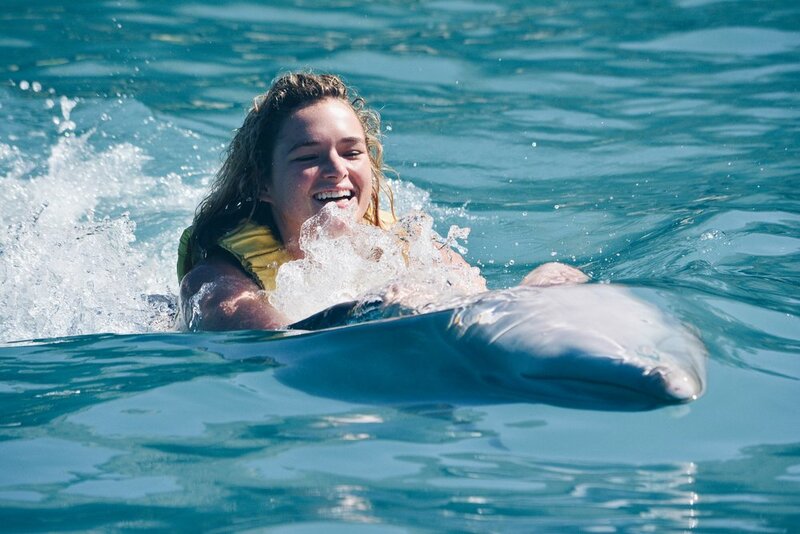 I'm not sure words could justify my dolphin swim experience... majestic? awestruck? Just thinking about it still makes me smile. If you ever get the chance, and if you know the dolphins are treated well and with respect, do it! The open bar at our Mexican stopover. (With wifi - strong enough to FaceTime friends and make them slightly jealous.) The bartender loved banter almost as much as he loved making a good cocktail! Such a fun day! My first (and probably last) selfie with a dolphin!